It's amazing some of the things you can find in the pound shops in town. I'd trawled them all this week looking for bits n bobs for Jack's homework project, and stumbled across this Sock Teddy Kit. I figured "for a pound... what can I lose if it's just tat?" 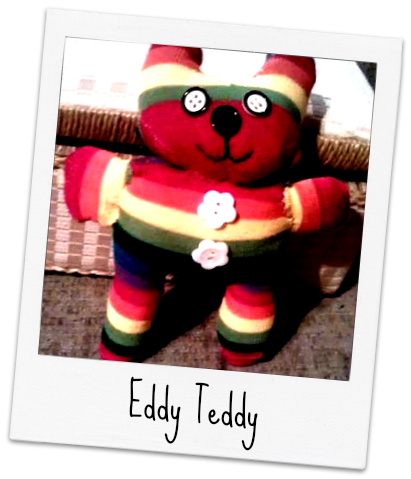 It's a Crafty Kidz Make Your Own Rainbow Teddy Bear. I'd share a link with you for them, but I cannot find them on Google at all. The kits are for sale all over eBay though. In the kit you get a sock, some stuffing, thread, needle, and the buttons for the belly, eyes, and nose. And very simple instructions. I spent a very chilled evening sat with my feet up and the telly on, snipping, sewing, and stuffing. And voilà! One cute little bear. Although - as someone on Facebook said - it looks less like a bear and more like Henry's Cat on Acid. That suits me fine though! The kids adore it! I have been ordered to return to the pound shop and buy another 3 kits so that they can all have one. Sadly there were none left. But I do now have the instructions... and kids who lose socks ALL THE TIME making an almost infinitely sustainable supply of odd socks. I even have a big bag of stuffing left over from a previous craft project. So all I need to ebay now are some cute buttons! Prepare yourself for more sock critters popping up on the blog between now and Christmas!